Here is a sneak peak of the Grand Cru 110bcd crank due in mid-summer. This rendering is not 100% accurate, but it's very close. The rings will be 48/34 and there will also be a triple version later. 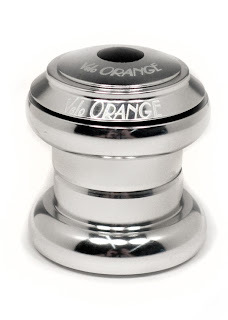 The crank is cold forged and the rings are full CNC 7075 alloy, so the rings should be super durable. The Q-factor is about 139mm and weight is around 670g. The price will be around $190. 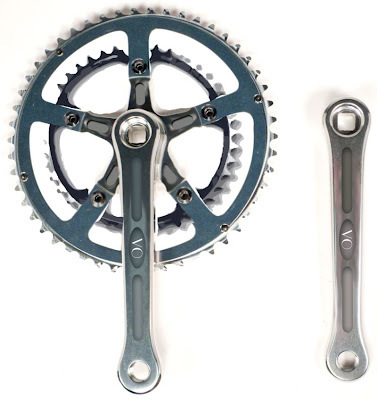 This crank will be one of two Grand Cru cranks; the other is the 50.4 bcd version. You like? 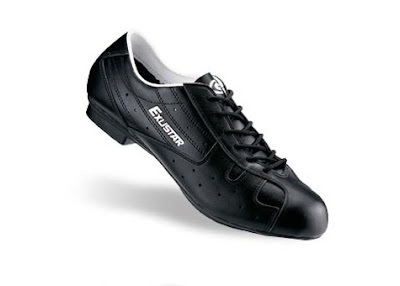 We have long wanted to stock a traditional touring shoe that was reasonably priced, shoes that you can wear on a club ride or with office clothes. The SRT707's uppers are full grain leather and the sole is rubber for easy walking. The midsole is fiberglass-reinforced nylon for comfort on long rides. They are SPD cleat compatible. I know that I said VO was not going to get into apparel, at least not for a year or two, but I really wanted a pair of these shoes for myself. And since I wanted them, wouldn't others? I've owned a couple of pairs of vintage touring shoes and loved the way the looked, but they never fit quite right. These are a little wider than the old European models, though I would call them medium width by modern standards, and the fit is much better. I also like that I can wear them with jeans or kahki shorts and they look like nice simple sports shoes, rather than futuristic carbon fiber space pods. For many years I've been wearing hiking boots made by Peter Limmer and Sons. Since 1919 this small New Hampshire company has been creating what are among the finest custom-made boots in the world. In fact, I used to live a few miles from their Intervale, NH shop and remember when they also had a climbing shop on the premises. Many years ago I had a long discussion with Peter about leather care. I thought the latest high-tech treatments were the way to go, but Peter patiently explained how they broke down the leather and shortened the leather's useful life. He had developed a natural leather treatment that would not over-soften or break down the leather over the years. I've used it on my boots and saddles and briefcases ever since. 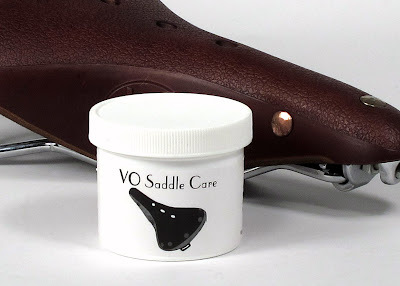 So when we decided to make a VO leather treatment we called Peter Limmer. It turns out that Peter rides a Brooks saddle (we're sending him a VO saddle ) and agreed to make a leather saddle treatment for us. It contains natural hydrocarbons, lanolin, silicone, oils, and a just little white camphor oil. That camphor oil was added because Peter's dog tried to eat the original mix, plus camphor oil smells nice. A four ounce (118g) jar costs $8.50 and will last for many years. Compare that to $9.75 for 28g of Proofide! By the way, I have a size 11.5W 11W pair of Limmer boots that's too small for me if anyone is interested. Update; they are sold. A few new products and miscellaneous notes. 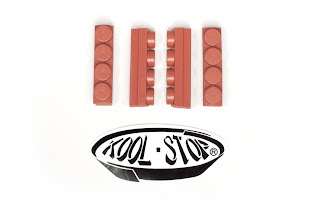 We have a small quantity of the new Kool Stop 4-bump Mafac-style brake pads. This style of pad has been very hard to find and we think it's great that they are being made again. So you can now rejuvenate those great old Mafac Raid brakes and put them on your new VP Rando or Mixte frame. We have only a small quantity now, but more are on the way. Our VO brake pads are now brick red (except the MTB straight-post). 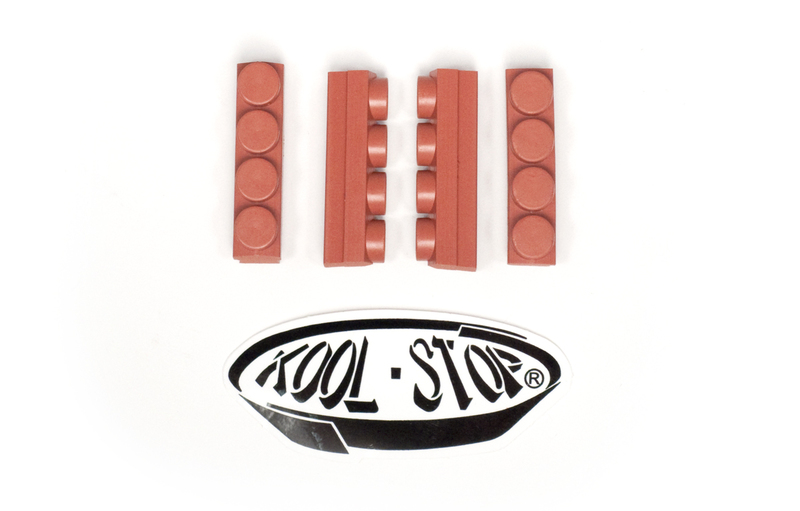 They are the same compound as the black and stop equally well; we simply like the look of the red pads. Simplex retro-friction shifters may well be the best downtube shifters of all time, but they used an odd cylinder-shaped cable end. And replacement cables have been hard to find. 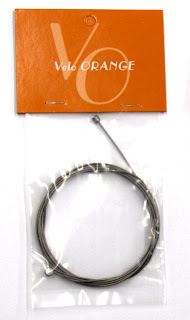 Fortunately the new VO shift cables have a Simplex and and a standard end; cut off the one you don't need. Simplex produced shifters for several other companies, so if you have old shifters that require funny cable ends, try these. BTW, this was Tom's idea so all of us Simplex fans should thank him. We have three new VO wheels, a 650b Diagonale/Formula fixie rear wheel, 700c Diagonale/Novatech dynamo, and 650b Diagonale/Shimano Nexus 8-speed. 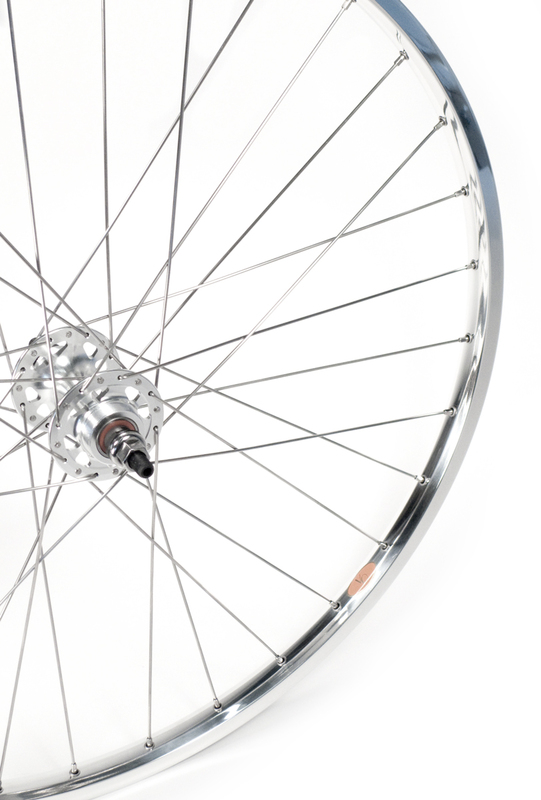 Several of you asked for the fixie wheel; let us know how you like them. We are working to post better photos of our components. Kyle shot new VO and Grand Cru headset photos that I think are are a big improvement over the originals. There are also photos of the headsets dissembled so you can see the bearing and races. Now he'll have to shoot the rest of our components; see what happens when you do a good job. On another subject, communication with VO, there have been some small changes of late. As we keep growing my duties here are shifting. For example, I no longer have time to personally answer technical and product information e-mails. That task has fallen to Kyle, Perry, and Pat. I think you'll find that they can take more time and provide a more thorough answer. Also, if you have questions specific to your bike, rather than general questions/comments related to a blog post, please e-mail rather than asking in the comments section. 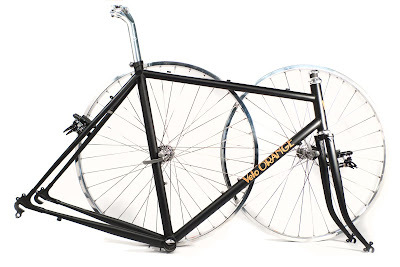 The VO Mixte is a fully lugged step-through frame. 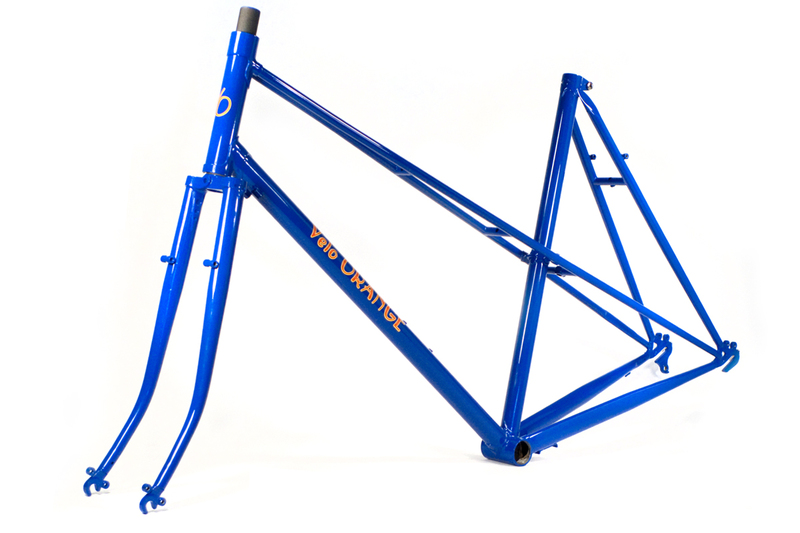 It is brass brazed from double butted chrome-molly tubing. It makes for a comfortable a city bike, but this is a light and stiff frame that will also be a pleasure on weekend tours or even club rides. While mixte frames are traditionally though of as woman's frames in the US, in Europe they are often ridden as city bikes by men who values quick mounting and dismounting. 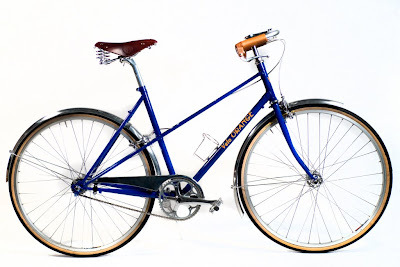 The Mixte has full braze-ons for fenders and racks, including douple drop-out eyelets. There is one bottle cage mount. It is brass brazed from 4130 double-butted chrome-moly tubing. The wheels are 700c and maximum tire size is 38mm. It uses extra-long reach caliper brakes. Note that the rear caliper is elegantly mounted on the mid-stay, so there is no awkward cable routing as with many mixte frames. The rear dropouts are horizontal so either internally-geared or derailleur drive trains work perfectly. Frame geometry can be found here. 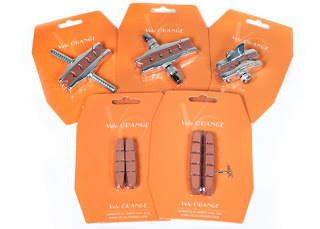 The headset is 1" threaded (ISO), brakes are extra long reach (55-73mm), BB is standard ISO (or British) with a spindle length to match your choice of crank, 27.2mm seat post, we suggest 45-55mm fenders, 132.5mm rear spacing so both road and MTB hubs fit. We had a fairly small run of these made, so they may not last long. The price is $525, which I think is pretty remarkable for a double butted, fully lugged, mixte. These items would total $757, but the kit price is $595. The kit is currently available only with the exact components listed above. And any other parts ordered at the same time are 10% off. It's funny how companies don't always follow our well considered road maps. 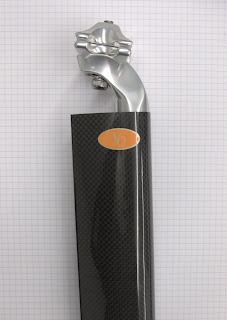 For example, we seem to be selling more VO seat post to racers and triathletes than to randonneurs and "country riders". Hardly a day goes by without an e-mail asking for a 31.8mm and/or carbon version. The reason is that all those folks riding too-small frames find benefit in increased set back. We see a similar interest in our stems. 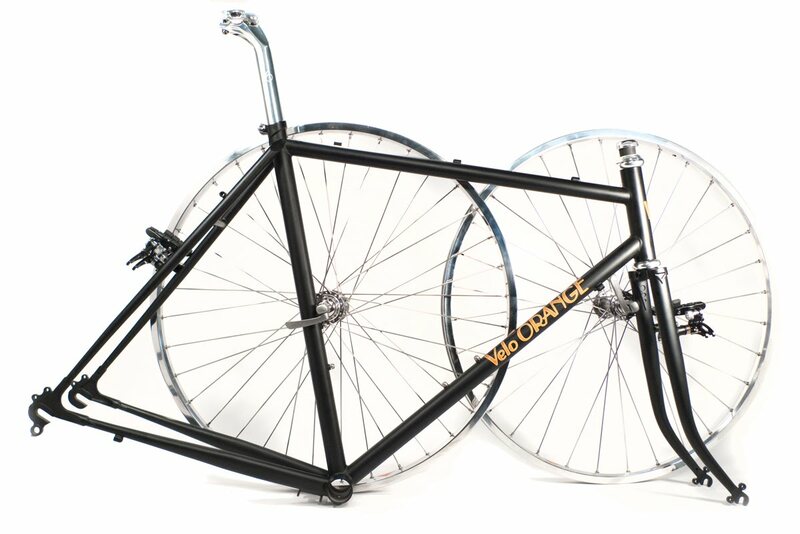 So we'll be introducing a new component line called Gran Rapide to meet this need. 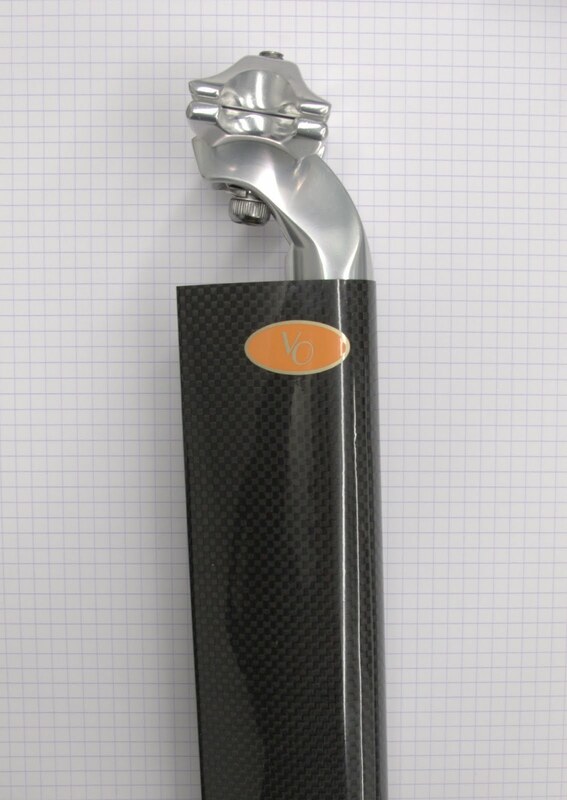 Our first product will be an aero seat post. We'll introduce aero stems next, then a deep-V version of our PBP rim. It's a new direction for VO, but we think it has great potential for expansion. Any ideas for new Gran Rapide products?